Smaller. Cheaper. PocketBeagle Fits Your Project. 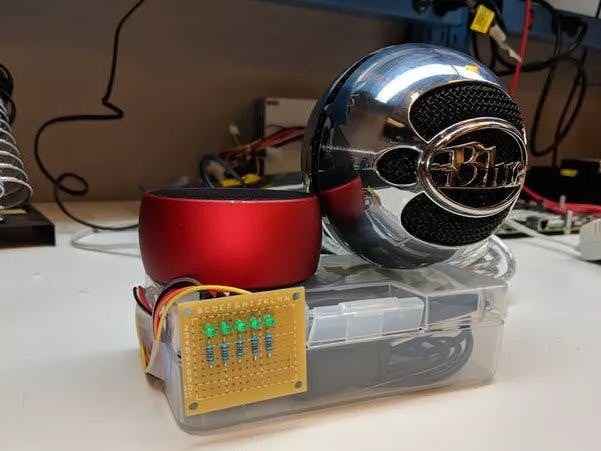 The newest and smallest addition to the BeagleBone family, the PocketBeagle, has been demonstrated by our own Jason Kridner in a Maker Faire Reveal. Implementing the new Octavo Systems OSD3358-SM 21x21mm system-in-package with 512MB DDR3 integrated RAM, this pup gives you much bark for your buck. 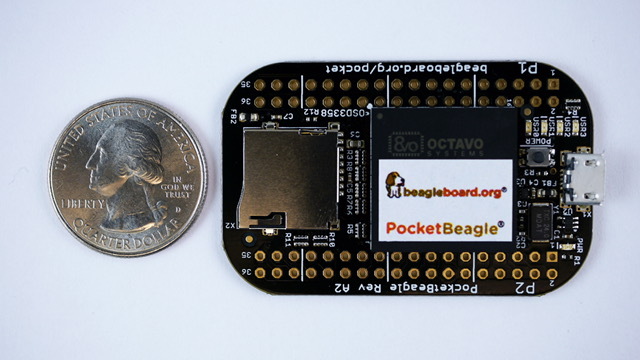 The PocketBeagle is a low cost, open-source development board for educational and professional purposes. Running Linux images customized specifically for BeagleBone and utilizing the web-based Cloud9 IDE, programmers of all skill levels have much to benefit from the extensive included library and comprehensive wiki. Additional information including schematics and bill of materials are available on GitHub. 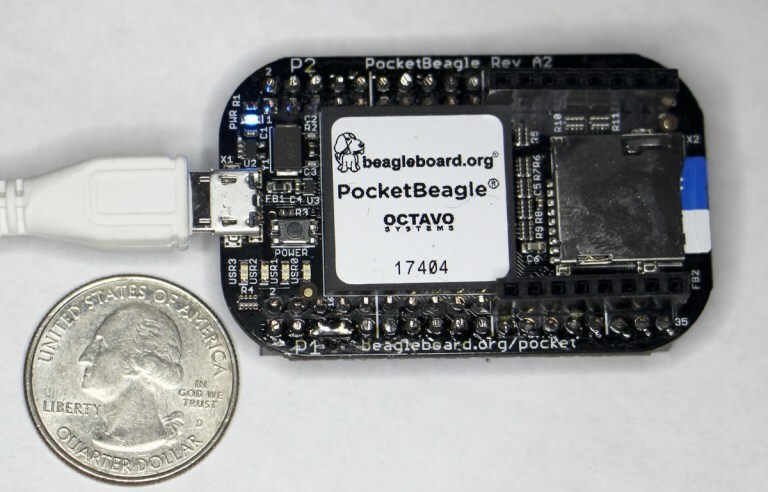 The PocketBeagle is available from Arrow, Digi-Key, Element14, and Mouser. Additional components called Click Boards give the PocketBeagle even more functionality, from GPS to lightning sensors. We're excited to provide yet another accessible resource to our community to realize their ideas and potential. Embedded Apprentice Linux Engineer (E-ALE) is a series of 9 seminars over 3 days at existing Embedded Linux conferences. "This article discusses my experience trying out different features of the PocketBeagle, along with some technical details." "Much has been made of the complexities of the Linux device tree configuration mechanism–it is both a savior and a curse." by Jaime Vaughn. 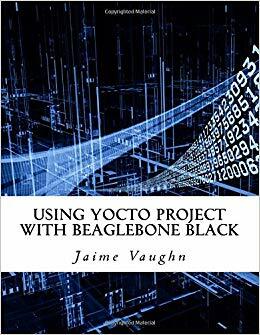 Starting with a basic introduction to Yocto Project's build system, this book will take you through the setup and deployment steps for Yocto Project. You will develop an understanding of BitBake, learn how to create a basic recipe, and explore the different types of Yocto Project recipe elements. "In our latest experiment, we replaced our processor board with the PocketBeagle and now we have an awesome Linux based car tinkering platform!" Vaishnav Ma announced the new BoneScript beta release, with installation instructions. A community discussion on RAM extension. Houston weather changes drastically from day to day and I need an easy way to tell what the outdoor temperature is each day. BeagleBoard.org Foundation is a US-based non-profit corporation supported by the open source developer community, Texas Instruments and others. All trademarks are the property of their respective owners.